Well, it's been another fun-filled week here in the United States of SecondTermica. Apparently flu season is in full swing around the nation, and some of the 57 states are reporting vaccine shortages. Outgoing SecState Hillary Clinton has ripped the admnistration for the vaccine shortage, saying "They're more interested in tax cuts for the rich than for flu shots for everyone who needs them". SecState nominee John Kerry chimed in, blasting the President by saying "If you can't get flu vaccines to Americans, how are you going to protect them against bioterrorism? If you can't get flu vaccines to Americans, what kind of health care program are you running?". Oh, wait a second. Those quotes from Clinton and Kerry were from 2004, blaming the Bush Administration for flu vaccine shortages. Sorry, my bad. The crazy was running on high in my home state of Missouri last week..... Paul Potter of Kirksville was charged with murdering a man and setting a fire to cover the crime. Witnesses in the public housing development in Kirksville reported Potter throwing objects at them. The objects were later identified as the detached arms of Potter's victim. No word yet on how he managed to stab his victim to death and dismember him with an AR-15. Wait, wait, wait, now I'm being told that no guns were used in the commission of this crime! Well then, move along folks, nothing to see here. Please be sure to duck as the severed limbs whirl overhead. Interesting developments in the Aceh province of Indonesia. Sharia law was introduced to Aceh in 2009, and a new regulation based on Islamic law is being introduced. 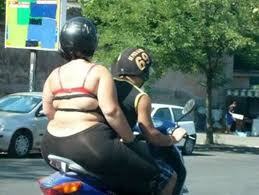 Women will no longer be allowed to straddle motorcycles as that position accentuates a woman's curves. Sidesaddle only ladies! I'm sure this can somehow be traced back to the Republican's war on women. What the heck was Jodie Foster talking about?? Didn't the Denver Broncos win an overtime playoff game last season with Tim Tebow at quarterback? Here is my New Year's plea to all the lefty statists out there......Can we all just put our cards on the table? Quit hiding behind bans of high-capacity magazines, Evil Black Rifles, smoking in bars, 32 oz sodas, blah blah blah. I would have more respect for you if you would just come clean and tell the truth. You want to ban private ownership of firearms, ban tobacco products, ban sugar, etc etc. Then we can have a real nuts and bolts battle for the soul of this country. Unfortunately, liberal tyrants are masters of incrementalism, gradually eroding both our liberty and the document that sustains it, slowly bleeding the personal responsibility from our collective pysche until we have no recourse other than to grovel at their feet for whatever pittance they deem us to deserve. Yeah, I'm talking about you Mayor Bloomberg. Do you know who Louie Giglio is? I learned of his story in the past few days, thanks to our brilliant reader Jill. Check back here tomorrow to read more about the latest escalation of Obama's remarkable hypocrisy.